Mike Ilitch, the 86-year-old billionaire who owns the Red Wings, Tigers and Little Caesars, is “extremely ill” and has been a no-show at recent events he’d normally attend, DetroitSportsRag.com reports. The news comes less than a month after Mike and Maria Ilitch announced a leadership succession plan that eventually will place the business empire in the hands of one of their sons, Christopher Ilitch. Jeff Moss, the reputable reporter behind DetroitSportsRag.com, broke news in March 2014 that Ilitch had colon cancer. Moss cited two sources who said Ilitch was in bad health. The inevitable change in leadership could have rippling effects across Detroit. 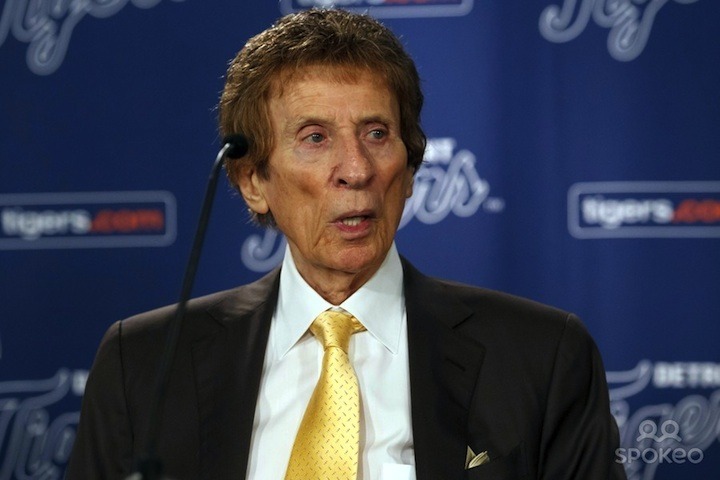 Crain’s Detroit reported last year that the Ilitches may sell the Tigers after Mike Ilitch is no longer at the helm. The family also owns the Motor City Casino, the Fox Theatre and many abandoned properties in the city, including a downtown theater, industrial buildings and apartments. Besides screwing the City on his water bills, it looks like poison pizza boy has done it with TV revenue also. I’m sorry to hear that. Colon cancer can be quite painful. Maybe he started eating his poison pizza pies. That will do anyone in. Why don’t you do us a favor and drop dead. Despite what people might think or not about Mike Ilitch. Years ago when everyone was running away from Detroit He stayed. Mikes wife and family have done a lot for the city of Detroit and the people who live here. I would like to take this time and thank them for everything they have done to help the old girl stay on her feet. (Detroit) Thank you, Mike and God Bless. I’ve got nothing bad to say about them, they made their money honestly (as far as I know anyway) and have been good for Detroit. I have no issue with how he earned his original money, but quute honestly the value of the Tigers dramatically increased when the TAXPAYERS gave him a new stadium. He did the same thing for a new unnecessary arena for the Red Wings. IF these are such development “magnets”, then private funding could have done it (like Mr Davidson did with the Palace). I understand what your saying. At this point Sean I `m not quite sure how I feel about using tax payer money for that purpose. I`m leaning to ward the side of distaste expecially when they tell Steve they will not release the information as to how the money will be spent. Not Cool.